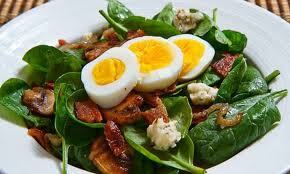 ...try this nice spinach salad recipe...great taste ! First of all Wash and drain spinach leaves. Next is to Tear into bite-sized pieces; set aside.And then Cover bean sprouts with boiling water; let stand 5 minutes; drain. Slice mushrooms. If using fresh zucchini slice into small pieces. Combine spinach, bean sprouts, mushrooms and water chestnuts or fresh zucchini. Refrigerate. Mix salad dressing and place in refrigerator. When ready to serve toss salad ingredients with sesame seeds and then add dressing. This nice spinach salad recipe is ready. Great taste. Enjoy it !